In India, there are many online P2P lending platforms. Some of these are involved in the business targeted at micro finance activities with the stated primary goal being social impact and providing easier access of credit to small entrepreneurs. What is Peer to Peer (P2P) Lending & how to obtain its Licence? P2P lending is a form of crowd-funding used to raise loans which are paid back with interest. It can be defined as the use of an online platform that matches lenders with borrowers in order to provide unsecured loans. The borrower can either be an individual or a legal person requiring a loan. The interest rate may be set by the platform or by mutual agreement between the borrower and the lender. Fees are paid to the platform by both the lender as well as the borrower. The borrowers pay an origination fee (either a flat rate fee or as a percentage of the loan amount raised) according to their risk category. The lenders, depending on the terms of the platform, have to pay an administration fee and an additional fee if they choose to use any additional service (e.g. legal advice etc. ), which the platform may provide. How to obtain a peer to peer lending licence? Refer to the below sections. Crowd Funding’ generally refers to a method of funding a project or venture through small amounts of money raised from a large number of people, typically through a portal acting as an intermediary. There are numerous forms of crowd funding: some are charitable donations that provide intangible benefits but no financial returns; others, such as equity crowd funding would fall within the domain of financial markets. P2P lending platforms are largely tech companies registered under the Companies Act and acting as an aggregator for lenders and borrowers thereby, helping create a match between them. Once the borrowers and lenders register themselves on the website, due diligence is carried out by the platform and those found acceptable are allowed to participate in lending/borrowing activity. The lender transfers money directly from his/her bank account to borrower’s bank account to obviate the threat of money laundering. The current regulations applicable to other NBFCs will be made applicable to the P2P platforms in regard to recovery practice. The operators to have a proper grievance redress mechanism to deal with complaints from both lenders and borrowers and require reporting to the Board. To include fit and proper criteria for promoters, directors, and CEO including a reasonable proportion of board members having financial sector background. Put in place adequate risk management systems. To submit regular reports on their financial position, loans arranged each quarter, complaints etc. to the Reserve Bank. Prohibit the platforms being used for any cross-border transaction in view of FEMA provisions relating to transactions between residents and non-residents. P2P lending platforms may be prohibited from promising or suggesting a promise of extraordinary returns, which implies some form of guarantee of returns to lenders. The P2P lending platforms under the purview of Reserve Bank’s regulation by defining P2P platforms as NBFCs under section 45I(f)(iii) of the RBI Act by issuing a notification in consultation with the Government of India. Once notified as NBFCs, RBI can issue regulations under sections 45JA and 45L. After the notification, RBI can issue directions under sections 45JA and 45L of RBI Act to such platforms regarding registration requirements and prudential norms. Considering the present stage of development, the platform could be registered only as an intermediary i.e. 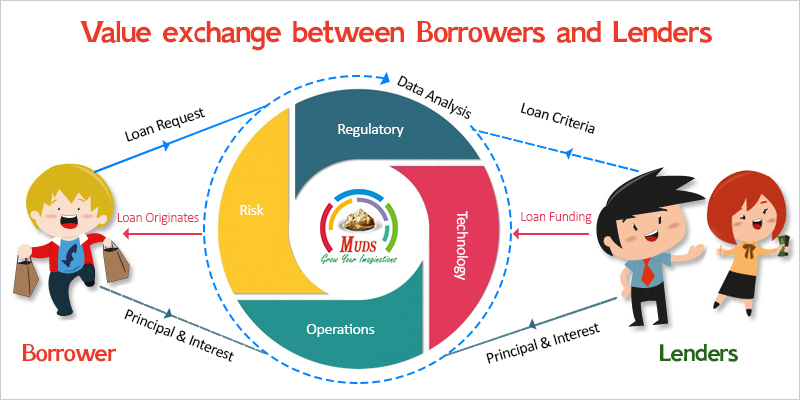 the role of the platform would be limited to bringing the borrower and lender together without the lending and borrowing getting reflected on its balance sheet.The platforms will be allowed to opine on the suitability of a lender and creditworthiness of a borrower. The prudential requirements will include a minimum capital of Rs 2 crore. The guidelines in this regard will include fit and proper criteria for promoters, directors and CEO. A reasonable proportion of board members having financial sector background could be suggested. The platforms need to put in place adequate risk management systems for its smooth operations. BCP and back up for the data needs to be put in place since the platform also acts as a custodian of the agreements/cheques etc. Most of the platforms operating in India provide a credit score for the borrowers using their customized algorithms. Confidentiality of the customer data and data security would be the responsibility of the Platform. Transparency in operations, adequate measures for data confidentiality and minimum disclosures to borrowers and lenders would also be mandated through a fair practices code. In order to assist monitoring, the platforms will need to submit regular reports on their financial position, loans arranged each quarter, complaints etc. to the Reserve Bank. The Bank may come out with a detailed reporting requirement. STEP-3 : – Granting of Certificate: After the application is filed, the same is examined by RBI and further documents and clarifications may be sought from time to time. Finally if RBI considers that the application is complete in all respects and all required documents and information is furnished to its satisfaction, it may grant Certificate of Registration to carry on the business. STEP-4 : – Choose a domain name that is easy for potential customers to remember. STEP-5 : – Set up p2p lending software. STEP-6 : – Attract customer by way of advertisement. NOTE:-RBI floated the consultation paper for peer to peer lending platforms in India in April 2016. RBI is expected to start a peer to peer lending license very soon.